In a small study that scanned the brains of teenagers while exposing them to tempting “food cues,” researchers report that reduced activity in the brain’s self-regulation system may be an important early predictor of adult obesity. The researchers used functional MRI (fMRI) scans on 36 New York teenagers to measure neural responses to food cues and found that food stimuli in the form of words activated regions of the brain associated with reward and emotion in both overweight and lean teens. However, participants who were lean at the time but considered at increased risk of adult obesity because of family history, had less neural activity in the brain’s self-regulation and attention areas than lean adolescents with lean mothers. fMRI scans are a noninvasive, minimal-risk method of assessing neural activation based on the flow of oxygenated blood to different brain regions. The investigators suggest that reduced activity in the brain’s self-regulation system may be a better predictor of obesity than heightened responses of the reward system to food cues. “Our findings suggest that we may be able to predict which teens will ultimately become obese adults by effectively looking at how their brains respond when they read a food menu. It is remarkable to me that we see these effects just by having participants read words like ‘French fries’ or ‘chocolate spread”, says Susan Carnell, Assistant Professor of psychiatry and behavioral sciences at the Johns Hopkins University School of Medicine, core faculty member of the Global Obesity Prevention Center at the Johns Hopkins Bloomberg School of Public Health, and the paper’s first author. “Clearly, we are not suggesting that we should scan the brains of every teenager, which would not be practical or cost-effective”, says Carnell, who conducts research as part of the Johns Hopkins Children’s Center, “But our findings suggest that obesity treatments and prevention interventions designed to strengthen the self-regulatory system may be more useful for teenagers than typical programs focusing purely on diet and physical activity, which have not been very successful at reducing or preventing obesity”. A report on the study, also suggest that finding ways to prevent the loss of serotonin or introducing a substitute neurotransmitter could slow or stop the progression of Alzheimer’s disease and perhaps other dementias. 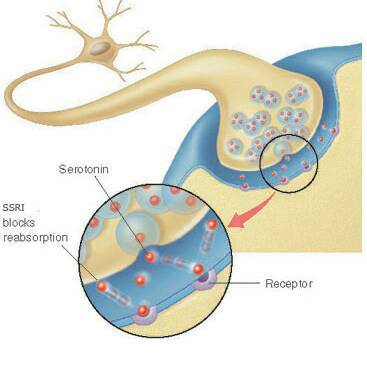 “Now that we have more evidence that serotonin is a chemical that appears affected early in cognitive decline, we suspect that increasing serotonin function in the brain could prevent memory loss from getting worse and slow disease progression”, says Gwenn Smith, Professor of psychiatry and behavioral sciences at the Johns Hopkins University School of Medicine and Director of geriatric psychiatry and neuropsychiatry at Johns Hopkins University School of Medicine. Smith notes that researchers have tried with limitedlimited success to treat Alzheimer’s disease and cognitive impairment with antidepressants such as SSRIs, which bind to the serotonin transporters. But since these transporters are at much lower levels in people with Alzheimer’s, she speculates that the drugs can’t serve their purpose without their target. The idea for Smith’s study was inspired by the work of co-author Alena Savonenko, Associate Professor of pathology, and her colleagues who showed that loss of serotonin neurons was associated with more protein clumps, or amyloid, in mouse brain. Laboratory studies suggest that an experimental drug already in early clinical trials for a variety of adult cancers might enhance radiation and chemotherapy for two childhood brain cancers that are currently almost always fatal. In a report on two studies conducted by Johns Hopkins Kimmel Cancer Center researchers, the drug, known as TAK228, suppressed the growth of human cancer cells cultured in the laboratory and significantly extended the lives of mice implanted with cells from the two cancers, diffuse intrinsic pontine glioma (DIPG) and atypical teratoid/rhabdoid tumors (AT/RTs). DIPG — a cancer in the brainstem affecting about 3,000 children worldwide each year — is universally fatal even with currently available treatments including surgery, chemotherapy and radiation. AT/RTs, the most common brain cancer in infants, have a similarly poor prognosis, with most patients surviving between six and 11 months after diagnosis. Hoping to help beat these odds, Johns Hopkins researchers and their colleagues, led by Eric H. Raabe, Assistant Professor of oncology and instructor of pathology at the Johns Hopkins Kimmel Cancer Center, focused their attention on TAK228. Previous research showed the drug (also known as MLN0128) can cross the blood-brain barrier and reduces the production of a protein called mTOR, which appears to sustain cancer by combining with other proteins to signal the cells to grow, invade tissues and survive therapy. Both pediatric cancer types typically have genetic alterations that lead to increases in mTOR activity, thus Raabe and his team’s hypothesis that TAK228 could be an effective treatment for these cancers. The team is currently investigating further how the drug works with radiation and chemotherapy, and if other drugs might be able to heighten this synergistic effect.